A Little Time and a Keyboard: Go Ahead, Hug a Tree with The Morton Arboretum and Learn How to Get Free Admission for Arbor Day!!! Go Ahead, Hug a Tree with The Morton Arboretum and Learn How to Get Free Admission for Arbor Day!!! A walk through The Morton Arboretum is always captivating. We all need a mantra for the year--something to inspire us and lift us to our goals. This year, The Morton Arboretum is challenging everyone to "Go ahead. Hug a tree!" April is the perfect time to celebrate your tree hugging spirit with Arbor Day on April 25. In celebration of this "tree-ful" holiday, The Morton Arboretum is holding several events throughout the month of April. There will be a 10K on April 13, an Arbor Day Plant Sale April 26 & 27, "tree-lightful" activities in the Children's Garden April 25-27, a special Hug-a-Tree Tram Tour April 25 and more! The fun will even branch out to Chicago where 2,000 trees will be labelled with bright tags providing information about the importance of trees. You may discover these trees yourself downtown from April 21-May 2. The message of Arbor Day will grow throughout the area! 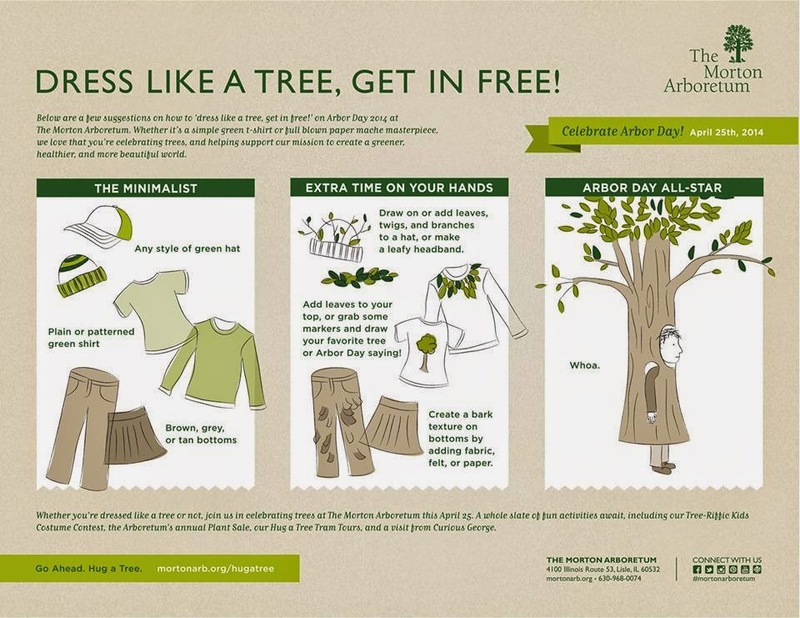 One particularly spirited event to help celebrate trees and their importance is the "Dress Like a Tree, Get in Free" Event! Wear a tree costume to the Morton Arboretum on April 25, 2014 and your admission will be free! Members who dress up will receive guest passes! Children under 12 that dress up are invited to join the Tree-rific Costume Contest in front of the Children's Garden at 10:30 AM on April 25. If you need some information for creating your tree, The Morton Arboretum has some below and has even set up a lively Pinterest Board! A fun event where you can share some pizzazz and enjoy a day at The Morton Arboretum! Trees improve our health and help clean the air we breathe. They also make beautiful preserves like The Morton Arboretum possible for us to enjoy. The Morton Arboretum has long been one of my favorite attractions in the Chicagoland area. So be sure to check out all that is in store for the Arbor Day Celebration! No that we finally have Spring, it may be time to check it out!